Absolute Oz Jobs: The ultimate jobs package in Australia! Absolute Oz is our most popular trip! If you dream of exploring Australia, seeing stunning sights Down Under and finding paid work on your gap year then this is the ideal trip for you! Aged 18-30? Take advantage of the working holiday visa scheme and enjoy up to a year in Oz. Beginning with a week of adventure in Sydney & at Beach Camp, you’ll meet new gap buddies and get settled in with this brilliant week of fun in the sun! Then it's time to get job hunting with the help of our expert jobs team in Sydney: We’ll help you find a job and get you set for up to a year of paid work. Get advice and assistance organising interviews & arranging accommodation, plus 12-months of job support and advice. Get paid between £10-£15 an hour to work in Australia. 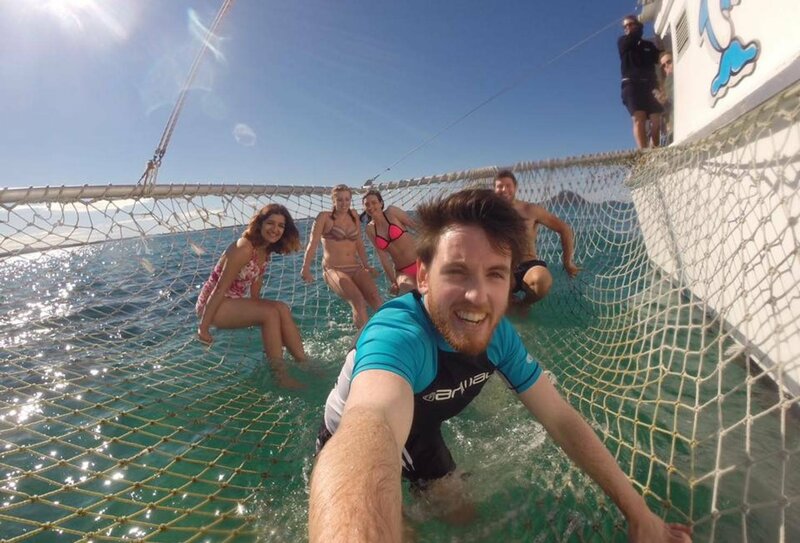 Earn money and have loads of awesome adventures on this Absolute Oz paid work programme! Week 1 is all about fun in the sun! Enjoy a whole week of group adventures in stunning Sydney and at beautiful Beach Camp, including city tours, sandboarding and beach time! This trip offers amazing flexibility, with jobs available all across Australia. Choose exactly how long you want to work and travel & tailor-make it to suit you - it's the ideal way to find paid work Down Under! Make friends and work down under! Day 2: Meet your new buddies in the morning, before heading out for a walking tour of the city, finishing at the world famous opera house! Day 2: Meet your new buddies in the morning, before heading out for a walking tour of the city, finishing at the world famous opera house! Day 2: That evening, meet for a welcome dinner and drinks in the bar! 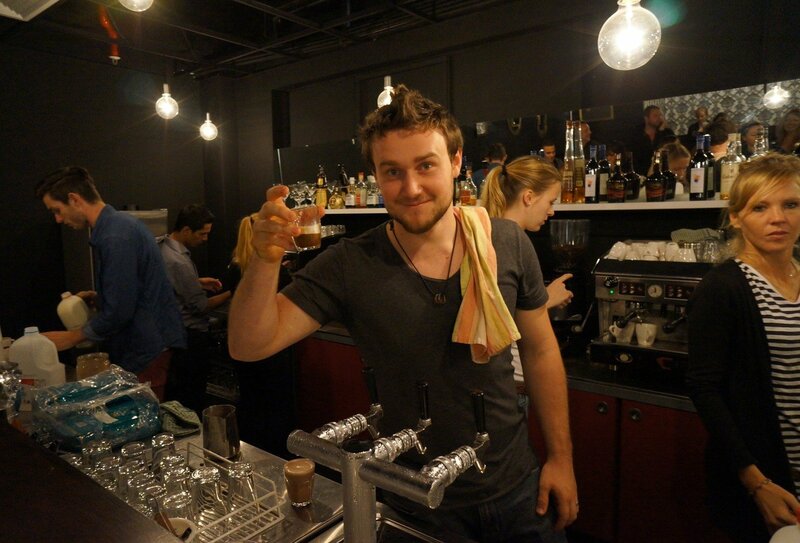 Day 2: That evening, meet for a welcome dinner and drinks in the bar! Day 3: Then after the orientation, jump on a private catamaran for a cruise of Sydney Harbour! 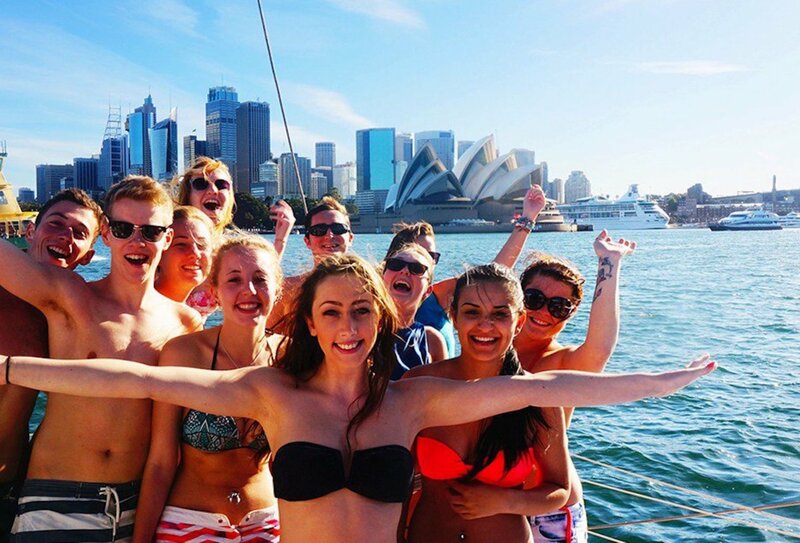 Day 3: Then after the orientation, jump on a private catamaran for a cruise of Sydney Harbour! Day 3: Watch the sunset over the bridge on the boat, before heading out that evening! Day 3: Watch the sunset over the bridge on the boat, before heading out that evening! 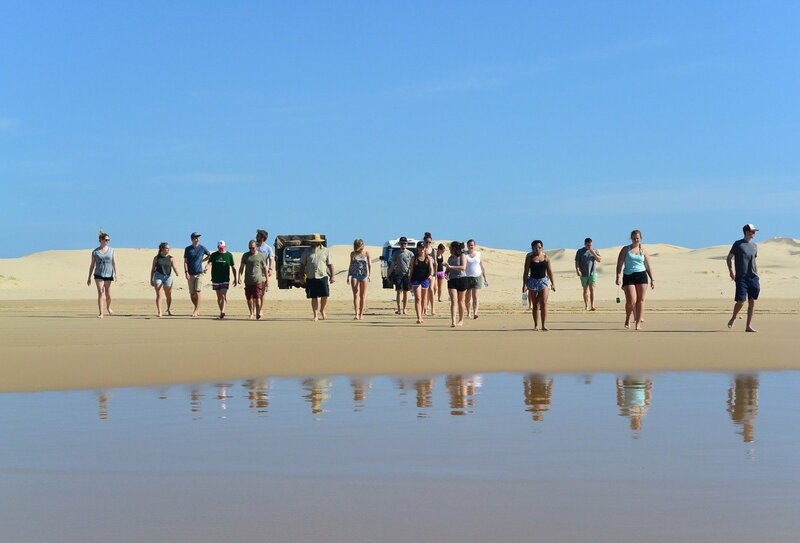 Day 4: Head up to our beach camp outside of Sydney, including it's own kangaroo! 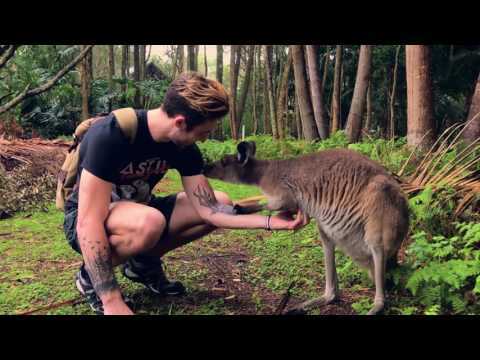 Day 4: Head up to our beach camp outside of Sydney, including it's own kangaroo! 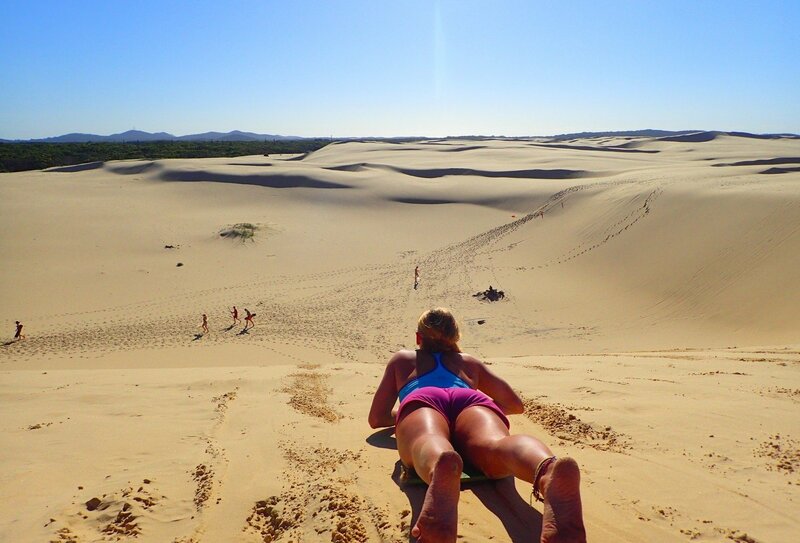 Day 5: Kick off the day with a 4x4 sand dune tour, and even try a bit of sandboarding! Day 5: Kick off the day with a 4x4 sand dune tour, and even try a bit of sandboarding! Day 5: After lunch, take a bush walk through Tomaree National Park for stunning views of the coast! Day 5: After lunch, take a bush walk through Tomaree National Park for stunning views of the coast! Day 6: Head out to spot some dolphins and whales on a cruise, before heading back to Sydney! Day 6: Head out to spot some dolphins and whales on a cruise, before heading back to Sydney! Day 7: That evening, hit the town for a big night out, including your own party bus! Day 7: That evening, hit the town for a big night out, including your own party bus! Day 8: Check out the amazing views along the coast from Coogee to Bondi beach tour, and relax on the one of the worlds most famous beaches! Day 8: Check out the amazing views along the coast from Coogee to Bondi beach tour, and relax on the one of the worlds most famous beaches! Day 8: It's the end of the week, and time to head off and start your working holiday adventure! Day 8: It's the end of the week, and time to head off and start your working holiday adventure! Having fun on a boat cruise! A fun, adventurous family are looking for an Au Pair to help care for their3gorgeous childrento help with getting themorganised forschool anddaycare,daily activities and entertain/care for the youngestchild whilst theboysare at school.Assisting with drop off and pick up of the boys to school and takingthe little oneto child care on Wednesdays, you pretty much can do whatever you want from 8.30 to 2.50 when you need to pick the boys up from school. Light house hold duties are required, making their after-school snacks, prepare their lunches for the next day and clean up any messes that they make and take them for play dates, walks etc after school. The family enjoy camping on long weekends and some school holidays and will be going to Katherine at the end of the year, exploring the swimming holes, Katherine Gorge, and other spectacular attractions. You’re more than welcome to join them! They live in a large four bedroom home all with built in, study/second living area on landing, three bathrooms (all with a toilet, large shower, vanity, main bathroom has bath), small saltwater pool, small grassed back yard, communal driveways with other two townhouses on the block. Close to the bus stop to town and the shopping centreisa block away, literally one block away from the beachand there’s plenty of lovely cafes and playgrounds nearby. Darwin is a lovely little city and although it gets hot, they have the pool for you to cool down. You will have your own room with a Smart TV,wifi, double bed and built in robes. There’s a full bathroom upstairs which you will share with the children. Also, you can enjoy the pool and take them swimming anytimeandhave plenty of free time to relax and explore this beautiful part of the world. In addition to your own private bedroom in gorgeous accommodation,free mealsandgenerous weekly money is also included in this fantastic opportunity. There are no service fees for you to pay for our service, however, we offer as much support as possible. Contact us today so we can talk to you more about this great opportunity! Are you looking for a unique Australian experience - want to earn money to go towards your next adventure? Thisclose knitlittle family are both very friendly and outgoing boys, always having a laugh and making the most of life. They are adventurous and enjoy bike riding, playing sports, enjoy being outside when they can and using the sun when it's out, especiallylovethe beach and swimming. Assisting with being that extra pair of hands whilst Dad is at work with morning routine, drop off and pick up from school and helping his son with homework in the evening. Light household duties and cooking will also be required and getting ready for bedtime routine. Their lovely large comfortable home is in a quietneighbourhoodin West Sydney, with your own large private bedroom, a double bed and built in wardrobe and a shared bathroom with the little boy. They are located a10 minutewalk to the train station to head into the city, shops or the beaches. Not only is your amazing accommodation included in your au-pair package, but so are your meals and generous weekly money.There are no service fees for au-pairs however, you will still receive all the support you need. You will have a fantastic social life on your time off meeting all the other Au pairs in and around the area as you! Call us today so we can introduce you. We are looking for 2 adventurous rad humans,to join our team onThursday Island in the Torres Straits! You will be working with our friendlyteam, with an ocean view all day long. (Find us on Instagram @makaithursdayisland to see what we're all about). Working full time, normally 5.5 days a week, closed Saturdays, half day Sunday :) We are very transparent and easy going, but we do work hard, so don't apply if you don't like to run! During tourist season we get quite busy, and as such require two more peeps to join our team this year to take the pressure off. To apply, you must be an awesome team player and have a sunny outlook on life, experience prefered but not essential, have a food handlers certificate (or be willing to get one), great attitude and be willing to do a minimum 3-6 month stay, longer is of course, available.The hourly rate varies depending on your age and skill set, in accordance with the Hospitality Award. Accommodation is arranged.Meals provided. Raddest bosses ever! If you are looking for your start in sales or have experience and want to take the next step, this is the job for you! As part of the job, we will give you a strong foundation in sales and marketing and help develop you into a sales machine! Being great at sales helps you in every aspect of life! We provide all the training and you will be working with a team leader each day until you get it right! We pay you daily – start tomorrow, paid next day! Getting to work with fun, young colleagues everyday. If you are outgoing and the kind of person who loves chatting to people, you could be just the person we’re after. If you love children, and being by the beach - then you can't look past this wonderful au-pair opportunity. A beautiful experienced host family are looking for their next Au-Pair to care for their 3 children (aged 3 years old and 3-month-old twins); this family knows how to welcome and make them feel at home. They are looking for someone kind and caring, who enjoy being around children and to give mum a second pair of adult hands to help with all 3 kids to keep them all feeling loved and happy. The Au-Pair will assist during the day-taking care of the youngest child and doing activities with him, taking him to swimming, kindergarten,& gymnastics. He enjoys going for trips to the beach, park, or the library and activities to join in with him at home like arts and crafts.Then giving mum a helping hand with the twins for difficult tasks as she will be home with you, when two sets of adult hands are required. This can sometimes include feeding assistance, settling help, meal prep, baths and going out of the house.Light house duties, cleaning up after the children, preparing dinner and snacks for the youngest during the day and getting him ready for bedtime routines. The family live in a brand new 4-bedroom home with 2 living areas, theatre room, 2 offices, 2.5 bathrooms and only a 150m walk to the beach in a beautiful tourist destination - Phillip Island. Many cafés and convenient takeaway outlets, icecreameries, retailoutlets, hotels and restaurants-there is something for everyone!! Your au-pair package includes your meals, private bedroom with queen Bed and walk in wardrobe, a shared bathroom with the kids and a separate toilet, Internet access, TV access with Netflix, a large selection of movies and gaming consoles, and use of a car. You will be provided with food at home and sometimes in cafes and restaurants if out with the family, as well as receive generous money with no bills to pay. You will still receive all the support you could need from us during the appliction process! Contact us today and find out more about this beautiful family and become their Au-Pair! Thisfantastic loving close familyhave 2 children, 1 girl aged 10 and a boy aged 3 and their pets -2 Cats and a Dog. They are an adventurous family and the children are activebyplaying sports,enjoy going to the park, swimming at the waterholes andthey do “far Friday”every Friday by either watching a movie or playboard gamestogether, they love to have a good laugh too! The Au-Pair will assist with the morning routines,school pick up and drop offs,during the day-taking care of the youngest child and doing activities with him. Light housework will also be required,cleaning up after thechildren, preparing dinnerandsnacksfor the youngest during the dayand getting themboth ready for bedtime routines. The family live in a lovely3-bedroom homewhere everything you could possibly need is only a street away-shops, parks and cafes. The Au Pair will have their own air-conditioned roomand will share a bathroom with the little family. Not only are allyour meals included,you will also receive generous money to care for the children. Contact us today so we can tell you more about this fantastic family. You will receive all the support you need from us during the application process! A beautiful, caring family with a 4 & ½ year old boy are looking for an Au-Pair to come and join in their fun-filled family adventures and to give Mum a hand whilst she is at work. Assisting with with before and after kindergarten care, drop off and pick up, light household duties including meal prep and getting the little boy ready for bedtime routine. As the Au Pair you will live in their 3-bedroom, 2 story town house, 5 minutes’ walk from the bus stop and 10 minutes’ walk from the shopping mall (Westfield). You will have your own private bedroom, queen size bed, with a wardrobe and drawers. It is a 15 minutes drive into Belconnen in the city centre, which there will be lots of spare time to explore the attractions of Canberra and even to Sydney to enjoy sightseeing. Not only is your amazing accommodation included in your Au-pair package, but so is are your meals and generous money. You will still receive all the support you need from us during the application process! Enquire today so we can introduce you to this incredible family! We are currently seeking someone who is fit, strong and willing to learn to join our team. We are on a cattle property in SW queensland, which also has a few sheep and goats. and any other duties that are part of life on the land. The wage is on a per day basis. Starting at $120 /day. Experience is not necessary but could be of advantage. There is no mobile phone signal here but there is WiFi. Lake House (2 Chefs' Hats) – Australia's iconic and most consistentlyhighly awarded Gourmet Retreat is located in Daylesford,80minutes from Melbourne and is surrounded by some of Australia's best producers and growers. We offer – Greatconditions; career advancement; the benefits of working with a much-awarded professional team; an opportunity to develop, learn and interact with a network of excellent local growers supplying some of the best produce in Australia. You will need - A good team work ethic; great cooking skills and a passion for creating beautiful food. Experience with contemporary culinary cuisine at a high level, an advantage. - Maintain a strong interest in contemporary culinary trends and consistently monitor and report on the work of other highly rated restaurants. Assistance with long term visa available if required. Waiters/Waitresses Needed for a Fine Dining Restaurant. The restaurant offers good quality fresh food quality menu. The client and is proud of their strong customer relationships and friendly atmosphere. We are looking Waiters and Waitresses who can deliver the highest levels of customer service and standards in their refined restaurant. If this sounds like the ideal opportunity, then please apply! Live-in Au Pair -Noosa- Sunshine Coast - Start ASAP! Lovely, professional single mum based in Noosa Heads, Sunshine Coast is looking for a mature, reliable Au Pair to support her full time nanny caring for her easy going 21 month old baby boy. Hours are flexible and part time. Mainly to assist with nights and early mornings . Mum is a single working parent and travels a bit for work. This lovely family enjoy a great lifestyle and enjoy the outdoors and beach in summer. Noosa is one of the most popular beachside holiday destinations in Australia. Located in Queensland’s Sunshine Coast, is surrounded by stunning beaches, lakes, national parks and the lush hinterland of Noosa National Park. Noosa has a relaxed feel and has shops, cafes, and nightlife. Just 1 1/2 hours North of Brisbane this is a very special spot. We are looking for an au pair who is easy going and can fit into this little family but also enjoys their own time. You must also love dogs - they have a gentle Beagle who is very much part of the family ! You will have your own wing of a large 5 bedroom family home and your own bathroom. The house has a pool not far from the beach. Hours needed would be approx 15-20 per week and pocket money, meals will be provided. This would suit an Au Pair who has good experience with babies/ toddlers who is happy to support this busy mum to keep the household running smoothly. The family are ready for you to join them any time from now, and ideally you can commit for a minimum of 6 months. A drivers licence would be an advantage but not required. If this sounds like the family for you - APPLY NOW ! Dream Nannies have exciting Au Pair Opportunities all over Australia and offer on-line training and support to ensure you have the best au pair experience. Caravan Park located in the beautiful Flinders Ranges SA is seeking expressions of interest from an experienced and motivated cleaning couple to share the workload throughout the week. Cleaning of amenity blocks, camp kitchen, cabins and bunkhouse, along with laundry duties will be required. Good physical fitness and attention to detail is a must! As we are coming into the high season, hours would vary with the couple required to work on an 8 day on 6 days off roster system enabling you to explore the beautiful region on your days off. The couple will be required to live on site on a powered site (own van required) at no cost and a small wage would also be provided. Immediate start required. Only those with own caravan need apply please. No single applicants, couples only please. Ultimate Travel is an International Gap Year and Adventure brand within the youth travel industry. Our tours are designed for 18-35’s who want the Ultimate Travel Adventure. Our Australian operation is designed around the UltimateOz program which welcome’s over 1,500 Working Holiday Makers to Australia each year. Be a confident public speaker and be able to present to upto 20 customers. Candidates who speak a second language will be highly regarded. We need you to tell us what you will bring to our role. Tailor your Cover Letter to our application to be considered for an interview. Buddy list - get in touch with others in your group before you leave the UK! The Absolute Oz programme is the ideal introduction into the world of Australian work, offering you a hassle-free way into the job market Down Under. 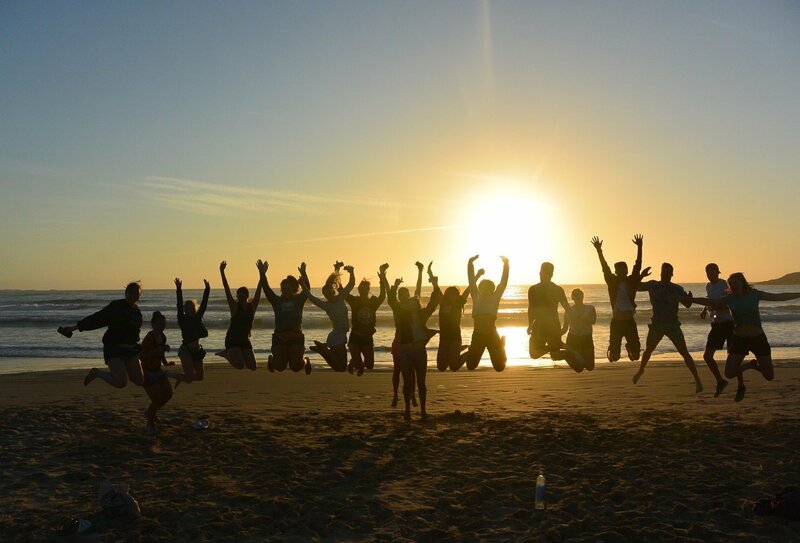 Before you begin your job search you’ll enjoy one week focused on fun, settling in and making new friends, which includes amazing activities & sightseeing in Sydney and at Beach Camp. Once your first week of fun is over you can kick-start your job search with the expert advice and assistance of our Sydney jobs team. Buddy list: Travellers on this programme will be given access to a buddy list, so you can connect with other travellers going on the same trip and start to make friends before you go! Day 1, Sunday: Arrive in Sydney. You will arrive on a Sunday and are then free to spend the day as you wish. 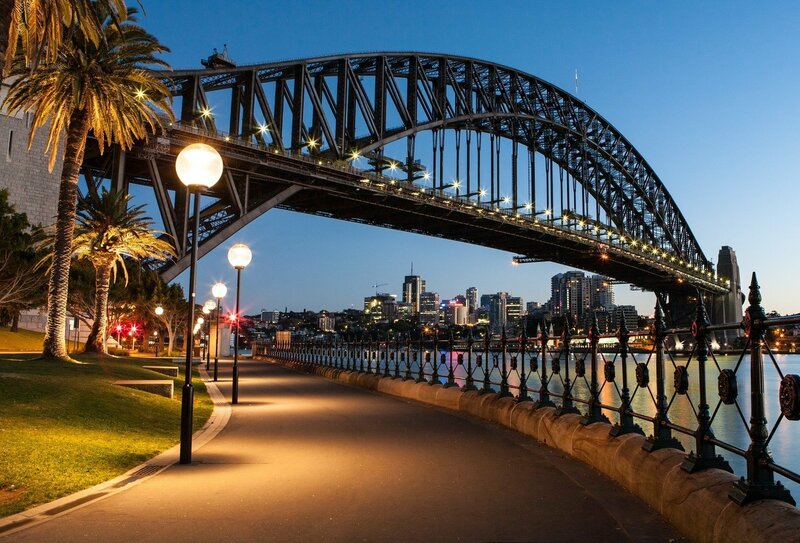 You can take time to relax, sleep off your jetlag or explore the sights of Sydney at your leisure. Day 7, Saturday: Party Night. 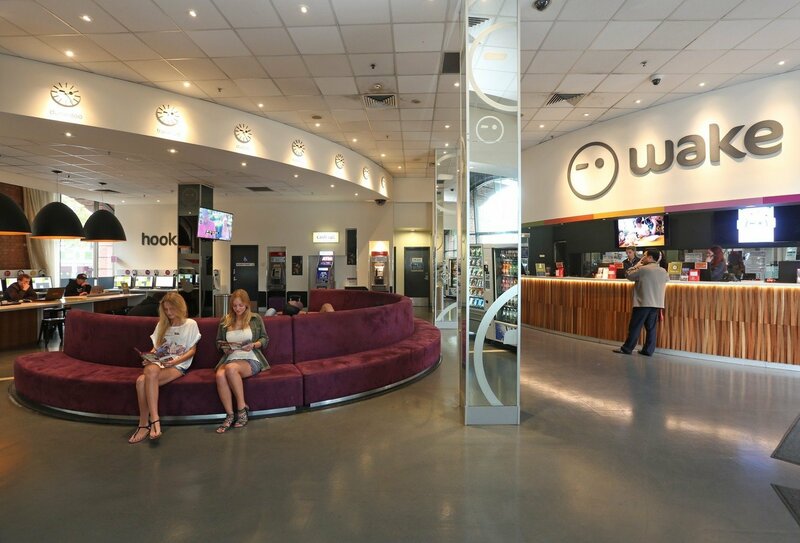 Spend today chilling out at the hostel or exploring Sydney. Today is also a good opportunity to ask the local team any questions you may have about your onward travel plans. This evening is all about partying as you meet your group at 7.30pm in a bar in Darling Harbour (bring your ID). 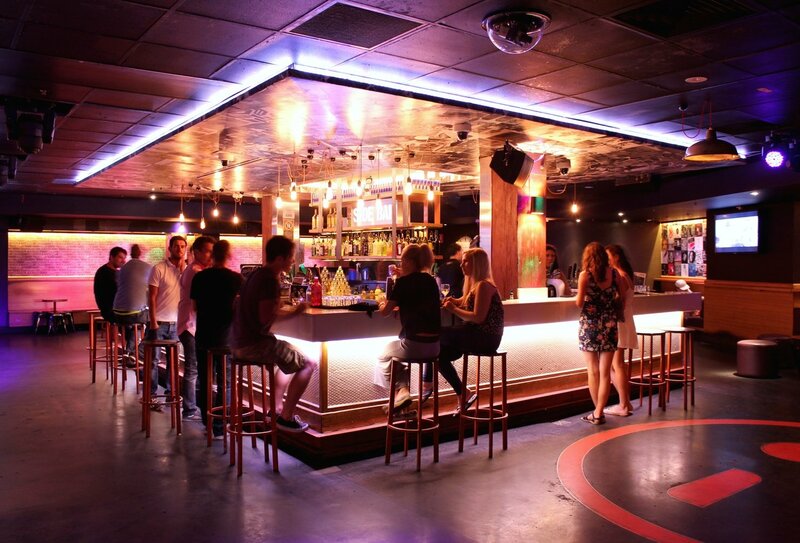 Enjoy entry to four city bars and clubs (plus 4 inclusive drinks!) as you kick off your night on the town. You'll be provided with a party bus for the evening so you can explore the streets in style on this Sydney city pub crawl! Please note that this itinerary is subject to change. Occasionally changes are made to improve our trips based on past customer feedback, our own research and other factors beyond our control, such as the weather. Under the terms of the working holiday visa, you can work for the same employer for a maximum of six months. You can continue to work for the same employer for a further six months if you switch to another branch of the company. Fancy an exciting stopover en route to Australia? Why not break your journey to Australia and spend 3 or 4 weeks in Thailand on our amazing Thai Adventure trip? Or break your travel in beautiful Bali and bliss out on beaches on our brilliant Bali Intro! If you select the Surf Adventure as an add on extra, please note that we operate this trip for all months of the year except June and July. You should arrange your flights to arrive into Sydney Airport (SYD) on a Sunday, depending on your start date. You will need to go to a pre-set meeting point at Sydney airport and a greeter will direct you to the shuttle bus which will take you directly to your hostel to begin your first week of fun and adventure! 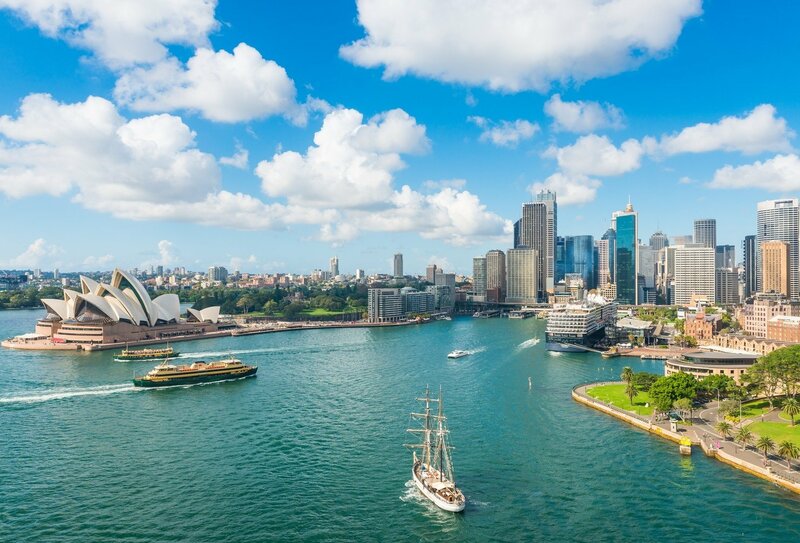 If you want to arrive a few days earlier into Sydney, we will be happy to help you organise any additional accommodation you may need (at extra cost). Please contact us for further details. 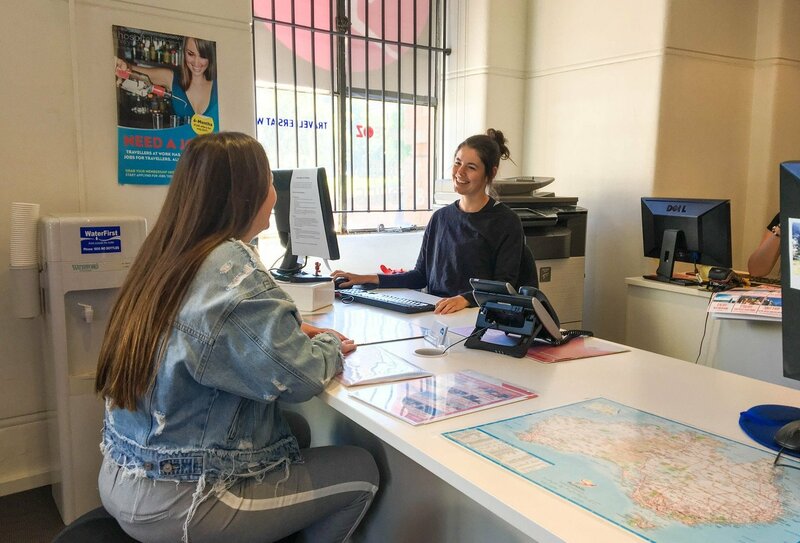 Your first week is all about fun and adventure in Sydney and at Beach Camp: Accommodation for the first seven nights of your stay is included, in a city centre hostel in Sydney during nights 1, 2, 3, 6 and 7, and in shared accommodation during your stay at beach camp on nights 4 and 5. If you wish to pre-book an extra night's accommodation on the final Sunday please let your travel advisor know and they will do this for you. The hostel is a hub of exciting city action, with its own backpacker bar where you can hang out with your new dorm buddies and stock up on tasty local tucker and enjoy a few drinks. The on site café serves breakfast and there’s also a kitchen with fridges and storage, and you can chill out in the TV lounge for some Down Under down-time. Beach Camp has free Wi-Fi so you can keep in touch with friends and family. You may stay in multi-share dorm rooms or camp outside in tents under the stars! In your first week, some meals are included, including a group welcome dinner of pizza on Monday, Beach Camp dinners (typical meals include pizza, fresh salads and wraps, steaks, sausages, chicken and pavlova or ice cream for dessert) and four free drinks on your Sydney bar cruise (see the itinerary for further details). 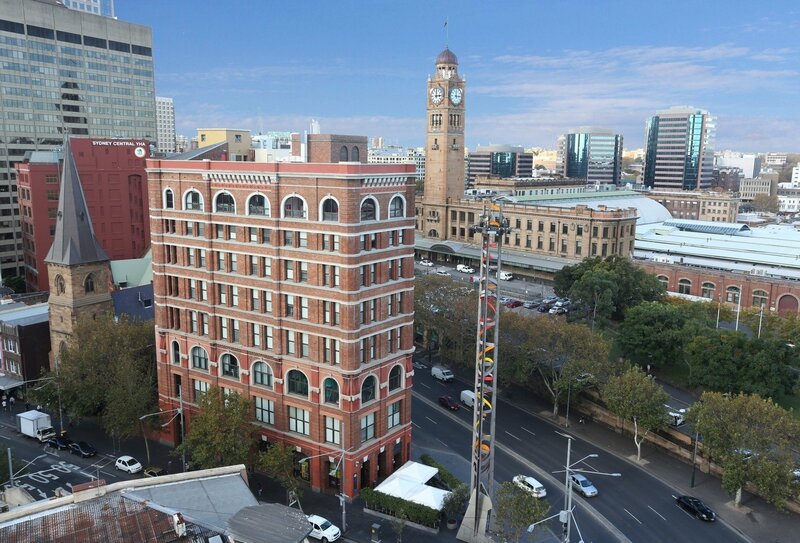 With cooking facilities and the on-site restaurant/café at the hostel, plus all of Sydney’s great restaurants and bars, you’ll never be far from your next good feed! What do I do about accommodation after the first week? After the first week, most of our travellers choose to rent an apartment, often sharing with the new friends they have made in the first week. Our team in Sydney will be able to help you explore possible accommodation options either in Sydney or elsewhere in Australia. Our team works with a local Sydney accommodation supplier who offers fully furnished accommodation in the CBD, Eastern & Western suburbs. Participants can make an appointment through the job team, to be shown different available Sydney properties. Please be aware that accommodation costs in Sydney can be high due to the desirability of the city as a location to live and work, but it's worth it for the experience! Alternatively, you can apply for jobs further afield in Australia. You can expect to pay at least £100-£150 per week on average for rent in Australia (costs in Sydney can be a little higher than average). The minimum contract is normally 3 months but some agencies will ask you to commit to six months. Alternatively you can extend your stay in a hostel - a great option for those that want to travel around. Hostels offer cheaper rates for those that want a long term stay. You can often walk in and get a room that day but we recommend that you make a reservation the night before. 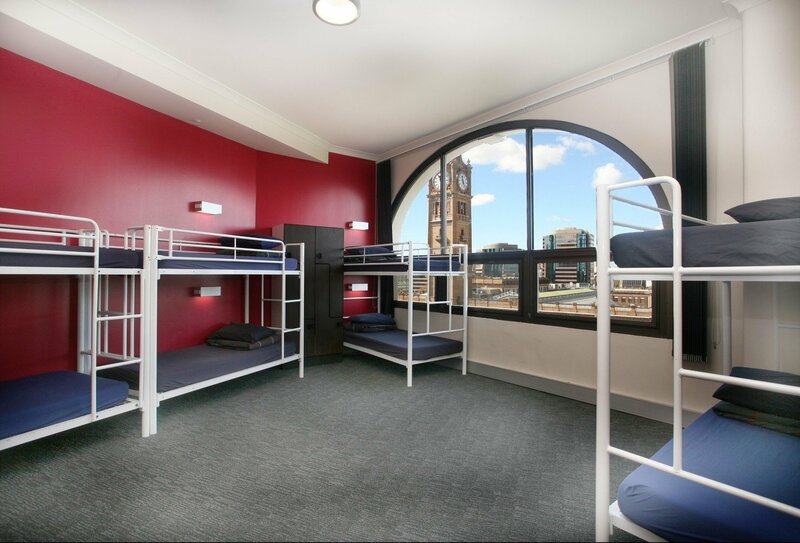 Depending on where you stay in Australia, you can expect to pay around £140-£175 per week in a hostel. Due to Working Holiday Visa (WH Visa) age restrictions, this trip is only available to 18-30 year olds. As you are planning to work in Australia whilst you’re here you’ll need to apply for a Working Holiday Visa. You can choose to book your Absolute Oz programme with the visa included.